If you are struggling to pay your bills each month you may want to consider pursuing an out-of-court settlement agreement with your creditors, rather than filing for bankruptcy or taking other action. Out-of-court settlement agreements are legally binding contracts between you and your creditor. Settlement agreements can reduce the amount of money you owe, extend the time you have to repay, and lower your interest rate. Settlement negotiations can be a very helpful tool for financially struggling families; however, it is important to have legal representation when negotiating with your creditors to prevent any unwanted consequences. Your creditors will likely have a team of attorneys working to protect them and you should have a skilled attorney on your side protecting your rights. In most cases, you will be required to sign a settlement agreement, these agreements can be difficult to understand and have hidden penalties that only an experienced attorney can identify. 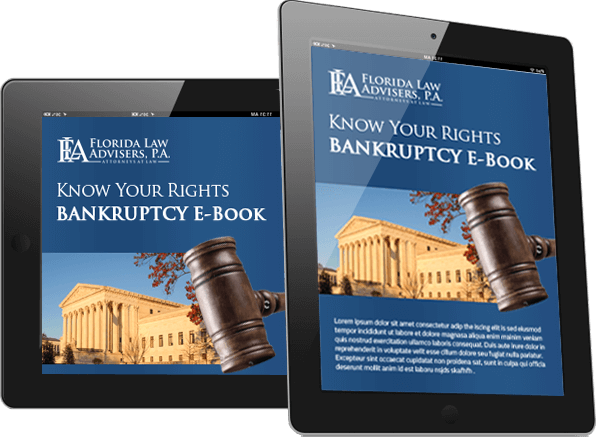 By working with Florida Law Advisers, P.A. to negotiate out-of-court settlements you can be confident your rights are protected and you are getting a fair settlement. Florida Law Advisers, P.A. takes a comprehensive approach to solving debt problems based on the particular facts and circumstances of each case. We are experienced and skilled in all debt relief and bankruptcy matters. Our vast experience allows us to cater our services to each client’s particular needs to provide for more effective representation. Regardless whether you need help negotiating with creditors, consolidating your debt, or filing for bankruptcy Florida Law Advisers can help. Our initial consultation is free and we offer flexible payment options to all of our clients. Contact us today by phone, email, website form, or website chat to schedule your free consultation with a debt relief attorney at Florida Law Advisers, P.A. Depending on the terms of your agreement you may have a tax liability for settling with your creditor. In some cases, a creditor will issue a 1099-C, which would require you to pay federal taxes on the amount through which the creditor lowered your balance. For instance, if during negotiations with a mortgage company the lender agreed to lower the amount owed from $150,000 to $100,000, the lender may issue you a 1099-C for $50,000. Under this scenario, you may have to pay taxes on the $50,000 you saved on your mortgage. Settlement agreements with your lender can be very helpful; however, other forms of debt relief may be more effective than negotiating with your creditors. For instance, in some cases filing for bankruptcy can provide more benefit to a borrower than out-of-court settlements. The most significant advantage of negotiating with your creditors is the possibility of reducing the amount of money you have to pay back. The amount of money you will be able to save on the debt will vary for each individual creditor. However, it is not uncommon for creditors to reduce the amount you owe by 30 -80% of the outstanding balance. Negotiating with creditors can also help with your credit score. If you fall behind on payments or file for bankruptcy your credit score will take a dive. Bankruptcy can stay on your credit report for up to 7 years and prevent you from getting that new loan or credit card you need. By negotiating with your creditors you can more quickly pay off your debt and prevent falling behind on the payments, which will help boost your credit score.